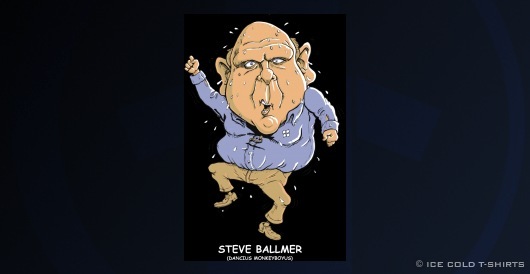 Steve Ballmer, now CEO and head honcho at Microsoft was, along with Bill Gates, intrumental in making Microsoft one of the largest and most well known corporations in history. Given his immense wealth and position, it's refreshing to see a grown man get really really excited, really sweaty, and really physical in front of hundreds of employees. This remarkable event, now known as "Dance Monkeyboy", was filmed and distributed online. The caption on the bottom is a comical take on the classic Roadrunner cartoon.